The easiest cheap chocolate wedding favors recipe is here! This is so easy I have even managed to make this with my 3 year old son, the only problem was that a lot was eaten in the making process, purely for quality control. and then a further 3oz of dark chocolate or cocoa powder for the decoration. You will need to make these only a couple of days before the wedding. Melt the 8oz of dark chocolate in a bowl over a pan of hot water, this will melt the chocolate without burning. You can use your microwave just be careful not to leave the bowl of chocolate in too long. While it is melting add the unsalted butter and stir in until that is melted. Place the bowl of melted chocolate and butter on the side and add 1/2 a cup of double cream. Mix it all together and now leave to cool, don't panic it should be a runny mixture. When it is cool, cover the bowl with cling film and place in the fridge overnight. The next day your truffle mixture will be hard and you can now roll it into balls and decorate. To decorate with the melted chocolate place the balls into the melted chocolate and leave to dry on some grease proof paper. 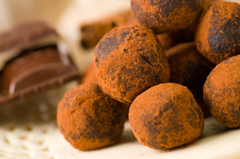 If you want to decorate with the cocoa powder then place the cocoa onto a plate and roll the truffle balls in it. To present as a favor either have them in a favor box - make sure they fit into the size you have! or into a papercase. As the truffles contain cream it will be best to store them in the fridge and consume within 3 days. You can change the dark chocolate for white chocolate or milk and decorate with anything you want. Have fun experimenting and if you have any left overs give me a call! You don't have to make these truffels, it can be a bit messy! Instead you could look at buying chocolates in wholesale quantities and then package them up as favors. Here are some very reasonably priced favors for you to have a look at. It is worth looking at the wrapped chocolates and also the personalized ones as you wouldn't need to have a favor box or bag with these. That would save you some more money!